While your doctor may be the one who makes the eventual diagnosis, this is a task that’s best done with a plethora of additional information. After all, there’s no way for your healthcare provider to accurately treat conditions without clinical laboratory tests. Fortunately, this is where LifeBrite Laboratories comes in. As an award-winning national clinical reference laboratory based out of Atlanta, Georgia, the talented staff offers unrivaled test result turnaround times. This similarly allows for better medical outcomes and treatment methods that put patients on the road to a faster recovery. 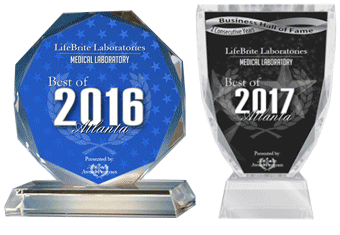 As the “Best Medical Laboratory in Atlanta” for both 2016 and 2017, LifeBrite Laboratories has undoubtedly proven its skills when it comes to molecular pathology, toxicology and chemistry testing. Since LifeBrite Laboratories prides itself on result turnaround times of 24 to 48 hours, medication compliance, possible substance abuse or workers’ compensation issues can be identified almost immediately. According to the U.S. Food and Drug Administration, medication misuse is defined as individuals with best intentions “treating themselves, but not according to the directions of their health care providers.”. The easy to read laboratory reports of LifeBrite ensures healthcare professionals will be able to chart a course forward for patients. For the above reasons and more, the Atlanta Business Chronicle recently nominated LifeBrite Laboratories to be part of its 2018 “Pacesetters” award ceremony. “Only the fastest-growing private companies earn the powerful Pacesetter designation and the invaluable attention that goes with it,” the Chronicle states, adding that recipients are “companies who have it in top gear.” Given the recognition that this facility has received over the course of its years in existence, it’s clear that doctors or other healthcare providers who need clinical laboratory testing will benefit from LifeBrite Laboratories’ extensive and accurate services.